If you are already in Armenia, spending a lot of time in your hotel room would be an unforgivable waste of time. Therefore, wake up early in the morning and start out your journey. Of course, do not forget about an Armenian full-of-vitamins breakfast with honey, dairy products, and fruit juice. It will not let you get hungry soon. Although, if you do get hungry, do not worry – Armenia is one of the places where you can eat healthy and delicious. We are sure you have already enjoyed Yerevan: walked in spectacular places, visited museums, listened to the exciting open-air evening concerts, and at the end tasted red dry wine and had a delicious dinner in Saryan Street. Martiros Saryan is one of the most famous Armenian painters. It is said that his colors convey the warmth of Armenian sun and the taste of harvest and fruits. The famous wine houses street that is in the city center is called after him. 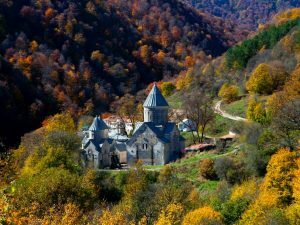 It seems, though, that we deviated from the main topic – let’s not forget that we are heading to Kotayk Province to see Garni Temple and Geghardavank. It is believed that there is no one in the world who has visited Armenia and has not seen Garni pagan temple and Geghard Monastery complex. But why these two landmarks go together? Because they are in the same province and are located very close to each other. First, let’s go to Garni. By the way, the road to the temple has recently been renovated and a special status has been granted to that area. That is, the road service will be permanent in all the months of the year, which means that even in frosty winter, you will get there without any problems very quickly in 20 minutes from Yerevan. The distance is about 25km. The pagan temple in Garni Fortress Complex is the only one that has survived to our days. In the 4th century, when Christianity was adopted, all the pagan constructions were destroyed. Only Garni was preserved, which, according to the historical facts, was built in the 2nd century. The fortress-complex is located in the Kotayk Province of Armenia, on the right coast of the Azat River. In the neighborhood, there is a village of the same name, where in autumn people make sweet sujuk (sujuk is an Armenian sweet made with nuts and special syrup). History testifies that in the 1st century Roman troops destroyed the castle, and in the 77, one of the Armenian kings restored it, built the palace and temple, transforming the complex into a military station and a royal summer house (residence). The temple of Garni is famous for its unique architectural style. The ornaments are particularly impressive. To the west of the temple, on the edge of the canyon is the hall of the palace, a little far from the palace is the royal bath which is considered one of the most interesting samples of the Armenian architecture. Especially noticeable is the mosaic floor, which is an episode from the Greek mythology. Now let’s move to Geghardavank. We will reach there from Garni Temple in 10-15 minutes, the distance is about 10 km. Even if you’re a bit tired, do not slumber. 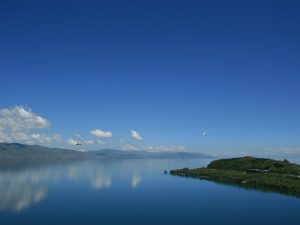 On the way, there is a wonderful view of mountains covered with forests, trails, springs, and rivers. And as soon as you arrive you will feel the smell of sweet gata (gata is a traditional Armenian cookie) and sujuk, which extends from the counters in the yard of the monastery. The voice of the Armenian duduk, zurna, and dhol will also indicate there has been a wedding ceremony in the monastery. Geghard is a unique monastery, they did not just lined the stones to build the monastery up but dug the building into an entire rock; this is why it is called a rocky structure. 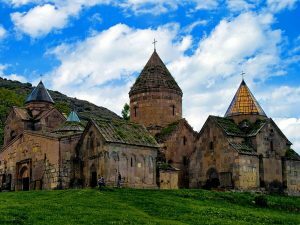 The historical facts evidence that the monastery was built during the very first years of adopting Christianity as a state religion in Armenia (the beginning of 4th century). By the way, Geghard in Armenian means a spear. According to one version, the name of the monastery originated from this word. The legend has it, that this monastery was given the sacred spear by which the Roman soldier stabbed Christ, and the name of the monastery was Geghard. At the end, do not forget to throw a coin in a natural (not handmade) well and keep a dream in mind while coming out from the monastery. By GreenTravel Armenia in Blog on November 30, 2017 at 10:23 am. Goshavank: a monastic complex where an innovative museum is to be opened. 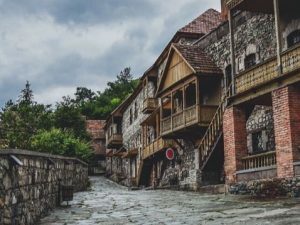 Dilijan: the resort city of Armenia where the first archaeological excavation was held.